I must tell you first that by „working with nucs“ you are for example not limited to 5 frame nuc boxes. With normal brood chambers and a divider it may be even better. If we speak of „working with nucs“ we only mean the methods how to handle our small cell colonies at the beginning. In the beginning we should work only with nucs until 80% of them survive under their own efforts. This means that we wait until a colony fills a chamber well and instead of putting on a second chamber we make a nuc with the queen. 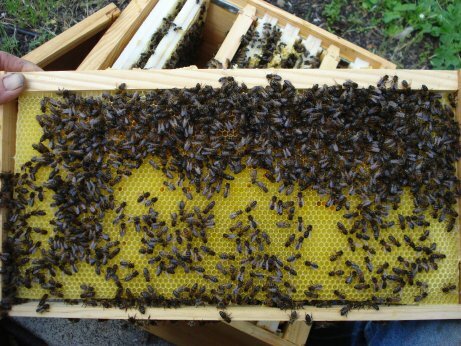 The most important thing in doing so is that we take ALL capped brood and make the nuc including the queen. To do this we take 3 or 4 combs with capped brood, the queen, honey and pollen, put it all into another chamber or nuc box and set this up at the same beeyard, but only with the hive entrance facing in another direction. and the nuc has also a kind of breeding pause because all the foragers return to the mother colony. Therefore both have an advantage concerning the reproduction of the varroa mite. If we do this very strong, with many bees, a lot of capped brood and a lot of food, we can repeat the same process after a short time. So we are able to establish a nice number of small cell populations in no time. If we work exclusively with nucs in the beginning, the problem with the varroa mite will be controlled. I have to add as well what happens in the nuc. Because we create the nuc with 3-4 capped brood combs we have many young freshly hatched bees in no time. A Langstroth comb 4.9mm has 8600 cells (a 5.44mm only has 7000 cells ) and if we assume that a brood comb has 2/3 brood cells, we have 17.000 bees coming on 3 brood combs (with 4 brood combs we have 23000 bees ). Because the nuc will be set up at the same beeyard and all the field bees return to the mother colony, the egg laying of the queen will be drastically reduced. And such a number of young bees which are not involved in brood care result in very sucessfully clearing out the newly infested cells. The coherence between numbers of bees, lifespan of bees, VSH, and cellsize will be introduced in our presentation. We must not forget to endow this nucs with enough food, pollen, and honey, because the most important thing is the strengh of the colony. Or in better words, the quantity of bees to do the necessary work. First the broodnest is much more compact because of the smaller cell size and the space between combs is smaller, too. So you need fewer bees to do the nursing. Second the life span of small cell bees is considerably longer compared to the big cell bees, so it obviously means that a surplus of bees is present in the hive to do the necessary work. By this large quantity of bees the VSH will be stimulated. Now we see the significant advantage of the working with nucs at the beginning of shifting to small cells. Because we of course know now that every beehive MUST deal with one or several crises until it can defend itself against the diseases. And with this strategy we will make it much more easier for our bees. The crisis will be less severe. On 8.2. I made a nuc of a Mini+ colony. It was really strong and sitting on 4 brood boxes Mini+. This means just about an entire brood box Langstroth. The nuc was done with 8 combs capped brood and the queen. This is the most important thing of this procedure. Added to that were combs with food, so that all this found space in 2 brood boxes Mini+. On top of this I added an empty box and the nuc was put in a new location nearby, so the field bees could return to the mother colony. This is very essential. The open brood remained in the mother colony and an empty box with foundation was added on top likewise. You can see the trick is, all is done very strong. Now I checked this hive again on 20.2. and lots of bees were hatched. The empty box with foundations I placed on top was filled and laid, so I had to add the 4. chamber on top. So I already can do the next nuc with the queen after 3-4 weeks. This is the trick with „working with nucleus colonies“. In this process the bees learn how to defend themselves against the varroa mites because we DON`T USE any treatment. If we would give them medical treatment even if it were the most harmless medicine, they would never learn this. Now you understand why we cherish this „work with nucs“.